Katie Stainton was consoled by her teammates. ENGLISHWOMAN Katie Stainton hit the deck after clattering into a hurdle in the first event of the heptathlon, bursting into tears as she was hit with the realisation her Commonwealth Games campaign may be over. It was a devastating blow for the 23-year-old, who was making her Games debut on the Gold Coast and the crushing scenes in the 100m hurdles were tough to watch. Stainton's body heaved on the track as she sobbed uncontrollably, waiting for medical staff to reach her. 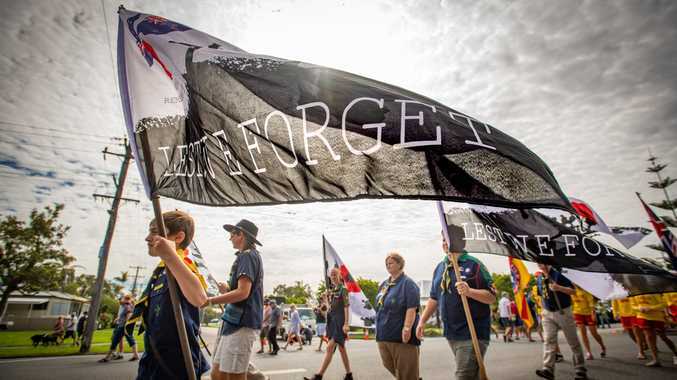 "That is the worst start to an event," Channel 7's Tamsyn Lewis said. "You can see her crying on the track. She knows that her campaign is over. The poor thing." However, there was one shining moment within the heartache. It won't have eased Stainton's pain - physical or emotional - but other athletes' display of pure class ensured there was at least one positive to come from her traumatic fall. 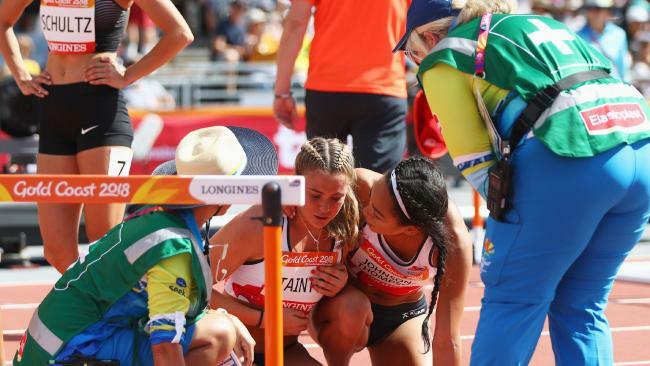 English teammates Miamh Emerson and Katarina Johnson-Thompson walked back down the track after crossing the line to check on their countrywoman and console her. They held Stainton and put their arms around her shoulders as she rose to her feet. 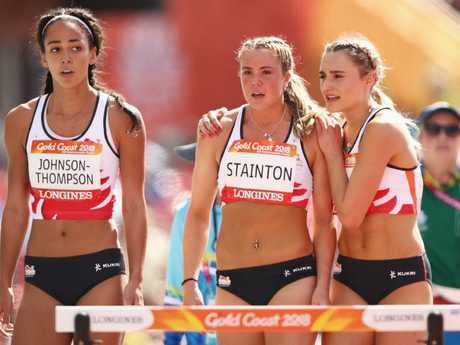 "These ladies really care about their competitors in this event and they are all walking down the track to make sure that Katie Stainton is OK," Lewis said. "You do not see that a lot in the track and field. This is showing that the heptathletes ... are the best sportspeople. "Great sportsmanship - she would be absolutely shattered. "All the athletes went back from that heat to make sure she was OK. It's a great camaraderie between the heptathletes. "It's just beautiful footage, great sportsmanship to see." Other competitors - not just English teammates - also checked up on Stainton and iconic sports broadcaster Bruce McAvaney was full of praise for act of compassion. "Katie Stainton fell halfway through the race and was in a lot of agony and you saw a great reaction from the other women," he said. "After the race this was fabulous, it's something we hardly ever see. They came right back, all the athletes to comfort her. "For Katie, it is just awful. They have shown compassion. A highlight - not a highlight for her - but a beautiful thing to see. "Just that respect between these heptathletes and athletes in general (is great)." Aussie Celeste Mucci crossed the line first in the second heat of the 100m hurdles component of the event with a sizzling personal best of 13.19 seconds, beating her previous PB of 13.46. Canadians Angela Whyte and Nine Schultz were second and third respectively. In the first heat Aussie Alysha Burnett was third with a time of 14.32 behind India's Purnima Hembram (second) and Ghana's Elizabeth Dadzie (first). It's not the first time we've seen classy scenes on the Gold Coast following a moment of pure devastation. Claire Tallent broke down on the streets of the glitter strip after being flashed with a third strike for lifting both feet off the ground when she was leading the women's 20km walk with less than 2km to go on Sunday. The gold was hers - but in an instant, ecstasy turned to agony. Tallent collapsed to the ground and broke down in tears. 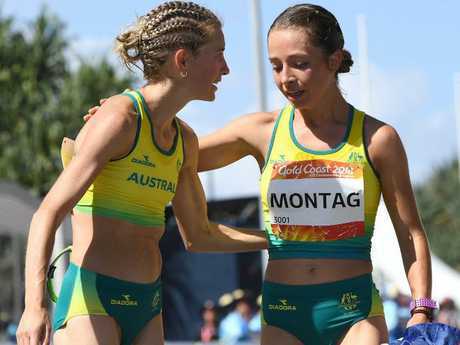 Despite her despair, Tallent delivered a moment of pure class to cheer on fellow Aussie Jemima Montag in her push for gold. With her emotions still out of control, Tallent stood up and cheered on Montag as she raced past her on the final lap. "Look at this. A bit of a shot. She is cheering her teammate onto the gold medal, Jemima Montag," Seven's Dave Culbert said. "She will know how upset Claire Tallent would have been," Tamsyn Lewis added. "That is amazing sportsmanship that we have just witnessed." Tallent was at the finish line when Montag finished the race in first position, hugging and congratulating her. Tallent (left) was still there to support Montag.